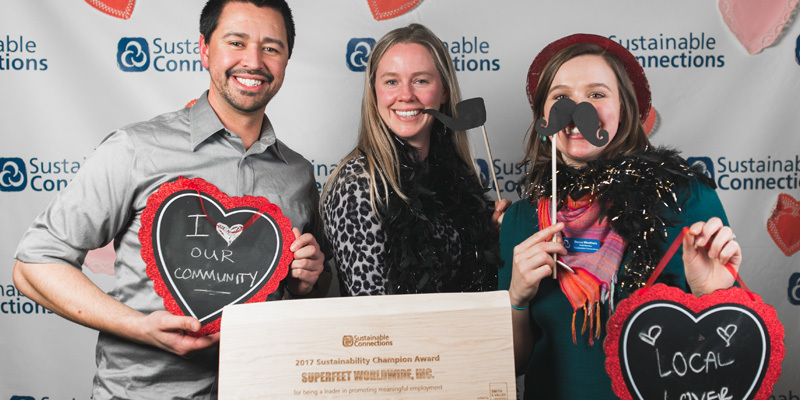 Congrats to our 2018 Sustainability Champion Award Winners! 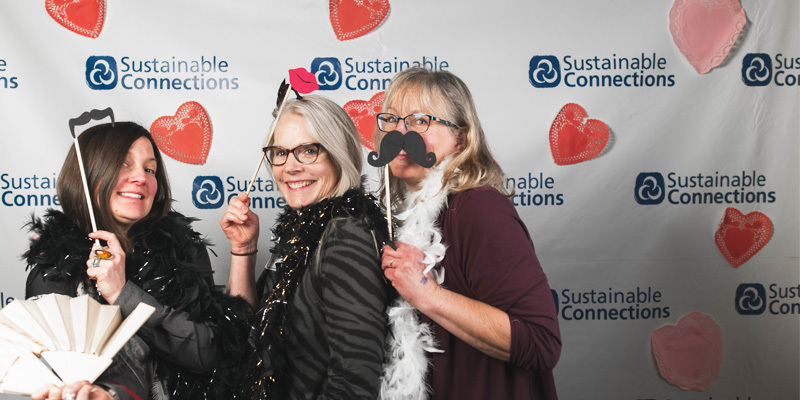 Sustainable Connections awarded four Whatcom County businesses and two individuals Sustainability Champion Awards last Thursday for their deep commitment to making a positive impact locally. The Awards are an annual recognition of Sustainable Connections members who are leaders in the following four categories: Strong Community, Healthy Environment, Meaningful Employment, and Buying Local First, as well as a Lifetime Achievement Award for an individual (or two) who has made substantial positive changes within their organization and the greater community. 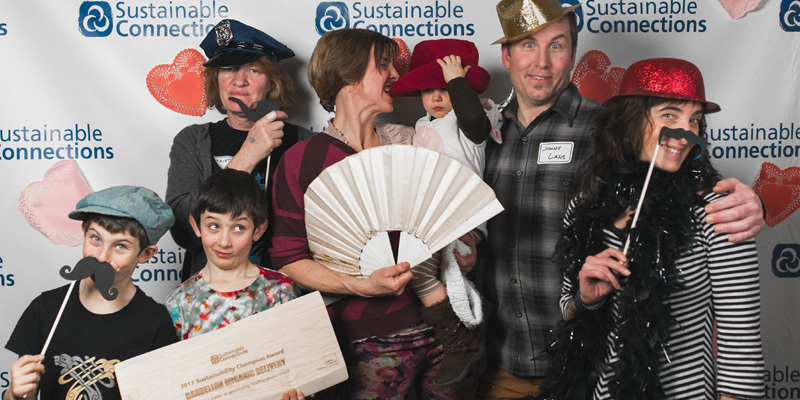 We had a great photo booth with some silly props, and had fun getting a little silly with these wonderful local businesses. These businesses actively engage our community, lead by example, and give back. They collaborate and share their knowledge with others. Dawson has proven their ability to strengthen the community in many ways. They give generously, champion initiatives that help people and planet, and directly support multiple community organizations. In 2017, they donated a Bobcat, worth $20,000, to the Whatcom Mountain Bike Coalition! Dawson also sponsors a myriad of events including the Jingle Bell Run for Arthritis and continually finds ways to help Whatcom’s youth, including being active with the YMCA and recently donating $100,000 toward the installation of a rooftop solar array for the new Sehome High School. Dawson excels at finding affordable, practical ways of making every project sustainable. 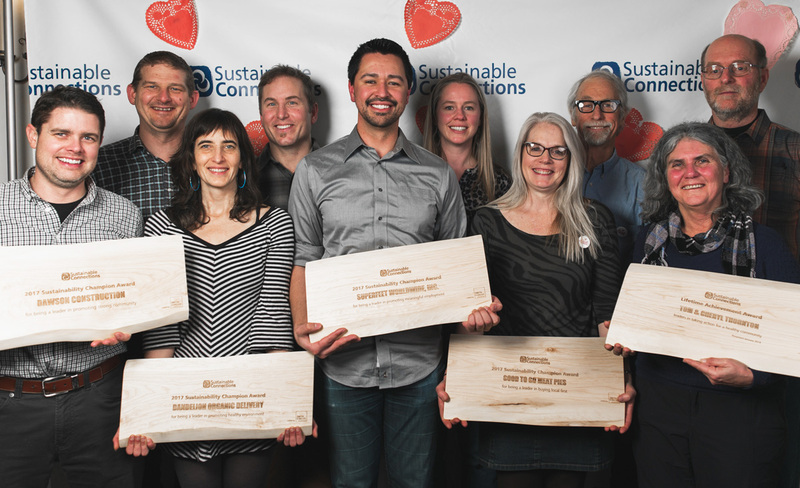 They are champions of net-zero energy building, solar, rainwater irrigation, green roofs, and responsible waste management. They are hard at work every day on projects small and large and continually find new ways to build a stronger community. 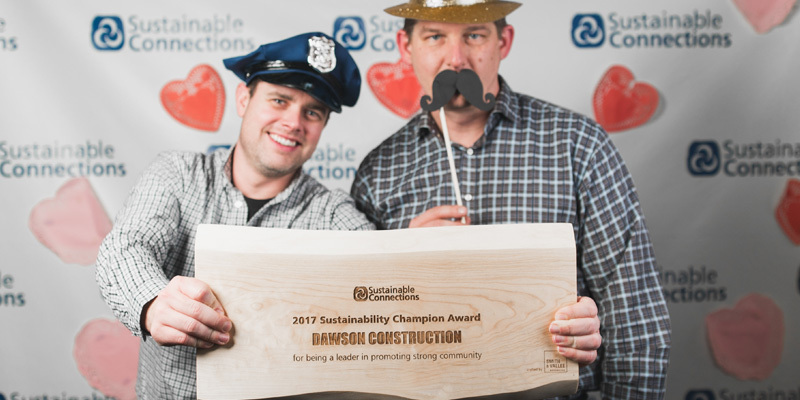 Jeremy Carol, Vice President, and Chris Abbey, Project Manager, pictured above were happy to receive this award on behalf of the company. These businesses measure the triple bottom line benefits (people, planet, profit) of their work. They inspire others to implement sustainable business practices, too. 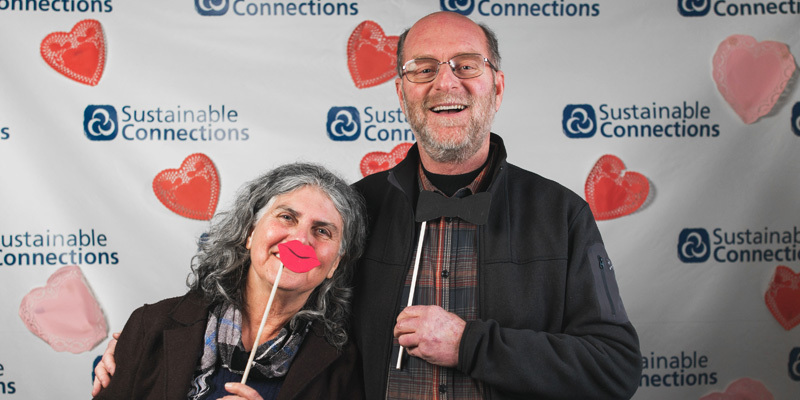 Owners Maria Stavrakas and Jonny Lane (on the far right) are dedicated to sustainability and have taken many steps to incorporate green business practices into their business model while educating customers at the same time. Their fresh produce boxes are seasonally sourced from over 30 local growers and have helped encourage the growth of sustainable farming practices and small family farms. They are completely dedicated to zero waste practices and produce only a handful of trash from their business each week. They also provide a plastic film collection service for their customers and go out of their way to deliver it to Northwest Recycling. By avidly reducing waste sources, re-using, composting, and recycling all leftover materials or produce, their trash is often made up of just a twist ties and produce stickers. They have also installed a 50-panel solar array at their business, use LED lighting and a tankless water heater, and purchase any additional electricity needed from renewable sources through Arcadia Power. During peak sunny season, nearly 100% of their use is supplied by their array! Not only does their product encourage healthy eating for their customers, their business strives to create a truly healthy environment for all! Also pictured on the far left are their kiddos, Thanos and Sotiri, and some of their beloved staff. These businesses provide employment opportunities that engage employees, provide livable jobs, and plan for the future. These businesses promote a strong and diverse local economy by taking measure to increase awareness about the personal, community, and economic benefits of choosing local first. Owner Holly Bevan-Bumford (pictured in the middle of two of her lovely employees) says that Good To Go has allowed her to combine her love of cooking with her passion for how food is grown and raised. She moved to Everson when she was young and has been an integral part of the community since then. Over the six years her business has been open, Holly and her husband Beau have continued to take steps each year to increase local sourcing. Their fruits and veggies come from local farms such as Broad Leaf Farm, Terra Verde, Hopewell Farm, and Cloud Mountain Farm Center during the growing seasons. During winter months, Good To Go purchases produce from locally-owned grocers such as the Community Food Co-op. Holly also works hard to source meat from local farms that has been humanely raised without any antibiotics. She proudly lets her customers know exactly where her ingredients come from. Items like flour, beef, cheese, pork, lamb, and chicken are sourced year-round from producers like Fairhaven Organic Flour Mills, Meadow Fed Farms, and Appel Farm. Good To Go Meat Pies is an incredible example of how a restaurant can thrive and support other local businesses at the same time. This award is given to a business leader(s) in our midst that are taking action to make our community even better, and represents all four tenets of strong community, healthy environment, meaningful employment, and thinking local first. The Sustainability Champion Awards are made possible in part by generous donations from our Sustainable Business Development Program Gold Sponsors: Sampson Rope and RDS Inc.; Silver Sponsors: Healthy Pet, PSE, and Itek Energy; and Bronze Sponsors: Beneficial State Bank, Samuel’s Furniture, Chrysalis Inn & Spa, Heritage Bank, Home 2 Suites, and the Mt. Baker Care Center.